Hi and thanks for taking a few minutes to learn a little bit about me. 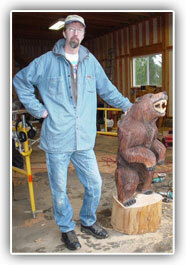 I am an Alaskan-born chainsaw artist, and I create one-of-a-kind sculptures. With patience and careful attention to detail, I create a wide variety of stylistic pieces ranging in size from one foot to fourteen feet. My wife Jennifer and I have been blessed to grow our business from a few carvings sold along the side of the road at our cabin in Clam Gulch, AK, to a thriving business in both Alaska and Washington state. We now have several distinctive lines...our smaller, stock items; our custom carved pieces; and our newest line--Sculptured Living. We are always delighted to meet our clients and customers and are thrilled to say that many of our pieces have found homes all over the world. I have since re-located to Port Angeles, WA, but will still spend a few months in Alaska each summer carving and developing my property along the Sterling Hwy. on the Kenai Peninsula. 30147 Sterling Hwy. Mile 78.3. If you are interested in commissioning a unique, one-of-a-kind chainsaw carved sculpture, I can be reached at 360-477-5888. Also see my contact page.